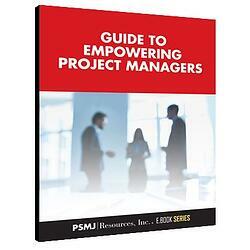 ARE YOU AN EMPOWERED PROJECT MANAGER? We all want the answer to that question to be a resounding “yes!”— but, sometimes, reality falls short of our desires. Knowing what it means to be an effective Project Manager is often very different from how to be an effective Project Manager, and when expectations of seller-doer miracles are piled on top of difficult conversations (ever had to tell a client “no”? ), feelings of empowerment often fizzle flat. That’s why we’re here to help. This complimentary e-book is designed to synthesize some of our most insightful and actionoriented advice for project managers. From entrepreneurship and leadership to project scheduling and getting out of trouble, this easy-to-follow guide will give you the jolt of helpful instruction (and encouragement!) you need to fire up your engines and take on that next assignment with confidence. We just scratch the surface here, but do hope you find this e-book to be useful and informative. As project managers, you’re the lifeblood of your company—so, what’s your next move?